This brand new production follows the classic Russian tale of Maria, the little girl whose love brings to life her cherished Nutcracker doll - a magical Christmas gift from her mysterious godfather - leading to adventures with the Mouse King, the enchanted Prince, and the Sugar Plum Fairy. "The art form of ice dance lends itself beautifully to this well-loved tale. Not only does the story entail some beautiful romantic 'adagios' with lifts and jumps, but the exotic 'divertissments' from Spain, China, Arabia, Russia and Egypt allow us to introduce some gymnastics, flying, acrobatics and special effects." What would it be like if the world was covered in ice and we skated around without car troubles or traffic jams? Well, until climate change takes inspiration from Michael Bay, we'll have to leave that question to our imaginations. 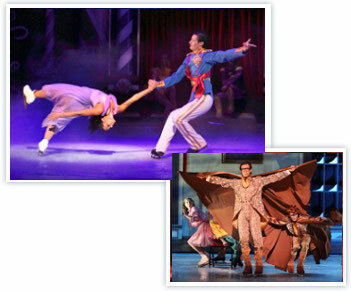 And nowhere is it more wonderfully imagined than in The Nutcracker On Ice, showing at the Artscape, Cape Town until 12 February, 2012, after playing to sold-out audiences in Joburg last year. However the atmosphere changes when the mysterious figure of Herr Drosselmeyer dramatically enters and starts to perform his famous magic tricks - with alarming results. There is a feeling of unease, as his presence gives off a strange foreboding. They journey onward to his kingdom in the Land of Sweets - a child’s paradise where everything you see you can eat, such as delicious Butterscotch Cobbles and Peppermint Twirls. The Prince introduces Maria to the Sugar Plum Fairy. 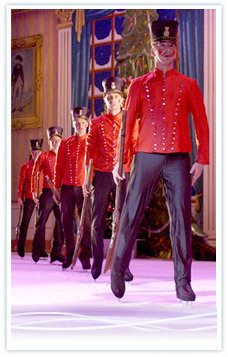 To celebrate the homecoming of their beloved Prince, the Sugar Plum Fairy organises a ‘Grand Celebration of Dancing’. The usual ETA Hoffman suspects are all there: the dreamy adolescent girl, her fantasy prince, the eerie Herr Drosselmeyer and the living Nutcracker doll. Only this time the characters, born out of Tchaikovsky’s music for the Russian classic, whirl around on ice. The Nutcracker is such a classic that no matter what guise it comes in, any iteration of it is surely almost guaranteed to be a success. And so it proves with The Imperial Ice Stars’ production, which touts the inclusion of Keith Chegwin and Olga Shuratenko as guest stars. But make no mistake, the troupe of dancers, with 250 championship and Olympic medals among them, are the real stars here. What is Christmas without The Nutcracker – to be honest, it’s somewhat overdone, but then you have never seen it spinning like this. BASED on Alexandre Dumas père’s rewriting of ETA Hoffmann’s tale The Nutcracker and The King of Mice, The Nutcracker ballet has been popular Christmas fare since first presented in St Petersburg in 1892. In the spring of 1892 Tchaikovsky premiered The Nutcracker Ballet Suite, a concert version of the ballet music in which he shrewdly included the most brilliant and original pieces from his ballet. The audience was so delighted by the piece that it cheered from almost start to finish, and at least six times demanded immediate encores of specific music selections.